bebop spoken here: CD Reviews: Carlos Vega - Bird's Ticket and Bird's Up. 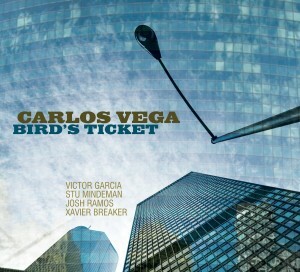 CD Reviews: Carlos Vega - Bird's Ticket and Bird's Up. Two CDs recorded not quite 2 years apart by a modern-day hardbop quintet led by Florida born Vega who also composed all of the 20 tracks on both albums as well as blowing some paint stripping sax. It's a humdinger of a band, all strong soloists in their own right and, importantly, team players too. Although the albums were recorded in Chicago, there is often a Miami Latin feel to the music -listen to the Cajon box* on Taurus and Virgo on Bird's Ticket! 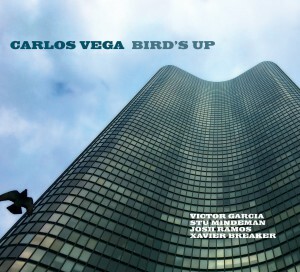 Garcia blows melodically, suggesting shades of Lee Morgan adding the fire when the occasion demands it which is often. Vega solos with both lyricism and freneticism taking the tenor into a harmonic world beyond the reach of many mere mortals. Meanwhile, back on Planet Earth, Mindeman, Ramos and Breaker prepare the ground for landing before taking off on their own musical adventures. Two splendid albums, both available on the Origin label. Personally, I think the boppier Bird's Up just gets the nod but it's a split decision with Garcia's solo on, On a Mission, certainly that of a man on a mission. Vega too is on a quest, a quest that should lead him to the higher echelons of the DownBeat Polls. The intriguingly titled - Untitled Waltz for the Wednesday Morning Prayer Meeting sees the quintet augmented by Cheryl Wilson's wordless vocal, some deft guitar-picking and a fatter ensemble with the added brass of Strand and Nelson. At the end of the day, after listening to both again I came to the conclusion that the best bet would be to spin a coin or if you've got coin to spare, buy both. Buy/more details Bird's Ticket - Bird's Up. Carlos Vega (tenor/soprano); Victor Garcia (trumpet); Stu Mindeman (piano/Rhodes); Josh Ramos (bass); Xavier Breaker (drums); Juan Pastor (Cajon on 1 track). As above minus Pastor plus Cheryl Wilson (vocal); Scott Hesse (guitar); Steve Strand (flugel); Michael B. Nelson (trombone) - all on 1 track only. *You don't need to go to Florida for a Cajon - there's a company in South Shields make and supply them!